1886 Bar’s Wild Orchid by Brady Weise. Beer cocktails are now a thing. Well, they’ve been a thing for awhile now, evolving from shandies and Micheladas of brunch cocktail menus of yore to the Hopping in the Rye with hop-infused gin by Matthew Biancaniello of the Hollywood Roosevelt’s Library Bar. 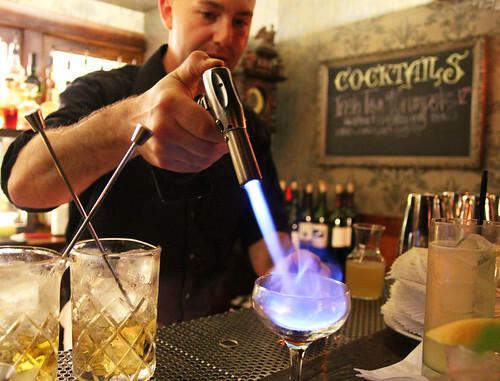 Some skilled bartenders, like Matt, have created concoctions respectful of both beer and spirit. But all too often that’s not the case and what you end up with is an unbalanced beer Collins where the beer’s effervescence is present but its flavor is overwhelmed by the spirit of choice. And, like it does for all cocktail geeks/beer enthusiasts, this makes me very sad indeed. What a waste of some fine booze. Fortunately, there is another L.A. bartender who’s doing right by beer cocktails: Brady Weise of 1886 Bar at the Raymond in Pasadena. Originally a beer guy who made award-winning home brews when he was 17, Brady uses his understanding of beer chemistry and tastes to create awesomely well-balanced beery cocktails. Brady Weise blazing the way for a new kind of beer cocktail. For the ultimate example of a beer cocktail done right, check out Brady’s shaken cocktail, Wild Orchid, in 1886’s spring menu. Made with Torontel Pisco, Vergano Bianco Vermouth, Combier and Hefeweissen, it actually makes your mouth tingle. “This one I’m quite proud of because the technique is progressing to the point where now we’re dealing with specific flavors that exist within the beer, we’re not just talking about the beer itself,” said Brady. The hef’s malty and citrusy notes are enhanced and complemented by the other ingredients. Usually bartenders tend to wimp out by using lagers and light ales in their beer cocktails because they essentially have no body. “It’s almost like using soda for everything,” he said. Or vodka. Check out 1886’s other spring cocktails which are now available. Standouts include the Rum Whistle, a bottled apple-celery cocktail soda, and the Vintage Caprice flight which presents the three stages of the cocktail’s aging, from freshly made to barrel-aged four months to barrel-aged 12 months.